An eclectic mix that combines flair with function. 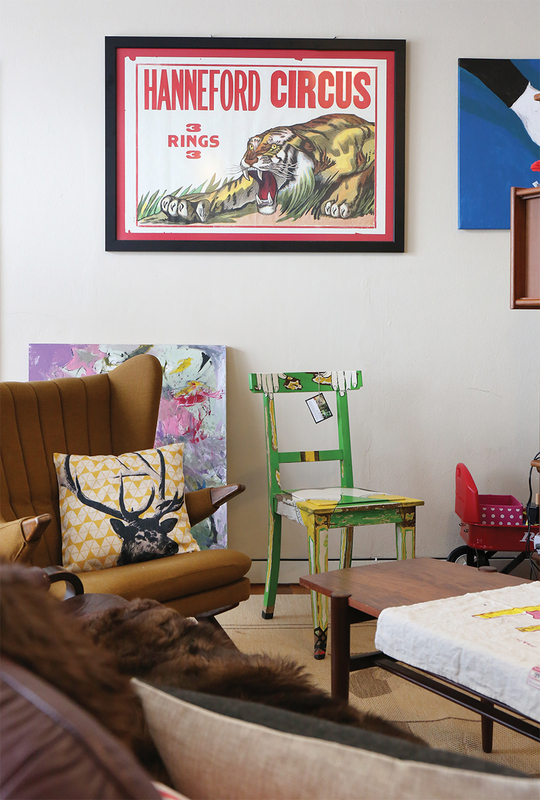 Neatly tucked away in the maze of complexes in Kiulap you will find Samo Furniture – an unconventional furniture shop that sells vintage pieces from all around the world. The store is the foundation for the home of storeowner, Saiful Amin, who lives on the top floor of this shophouse block. We were fortunate enough to be invited into his home to discuss how interior design went from being ‘A’ love to a lifestyle. The stairway up to this apartment in Kiulap gives us a hint that this living space has been meticulously designed.The beautiful wooden floors are illuminated ahead of you as motion sensor lights flick on when you approach. The red steel sliding door is robust in colour and in material. The interior is reminiscent of a New York loft. The working, living, dining and kitchen area segue into one another so that you immediately feel welcomed into the whole home. The open concept and wonderful synergy of otherwise mismatched objects are a reflection of the person who designed it. Saiful takes cues from his experiences and as a result, his tastes are cosmopolitan. He studied interior design in Sydney, Australia where his hobby of collecting vintage pieces began. His style has burgeoned into a wide range of pieces that create both his home and his profession. The apartment has definitely changed shape from its original form. 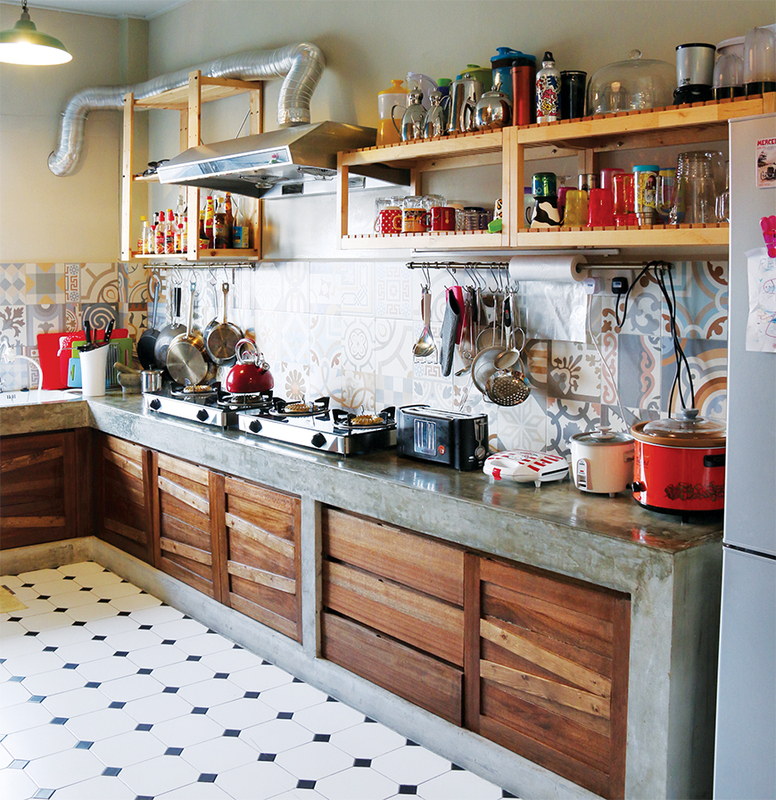 Saiful knocked down most of the walls to create the open concept. The exposed brick, and cement beams contribute to the modern aesthetic. It feels young, international, and a bit different. I mentioned his lovely hardwood floors and I learnt that instead of ordinary floorboards, he used wood meant for industry that he purchased at cost price. He then had these sanded down and fitted. I was delighted by this resourcefulness and adaptive use of materials that not only saves money – but is also sustainable and in line with his mantra ‘something a bit different’. Saiful’s style occurred organically, reflecting his eclectic taste in music, art and design. Over time his interests emerged into a lifestyle whereby he was able to do freelance interior design, and subsequently open Samo to house his various collections of furnishings accumulated from all over the world. Some of his most prized possessions include a hand painted chair by Danish artist Jette March and a cool theatrical poster from a 1940’s circus. I have seen similarly styled modern graphics that try to replicate the retro style but few people have the real thing! It is remarkable to see how such diverse pieces have come together so beautifully in his home so I had to ask what advice he would give to others wishing to design their space. The answer was refreshingly simple, “keep the space open, and fill it with things you love.” Adding a coat of paint and overlaying your existing floors with a material you like is a very simple, cheap and effective way of reimagining your space. Saiful’s unique style and innovative design techniques certainly makes his store and his home stand out. I imagine it to be an exciting and fulfilling experience to search for hidden treasures, each with their own history and story to tell; bidding for them against other prospective buyers and finally winning that prized piece for your home. Maybe you had never considered this option or maybe you never knew where to start, but if you’re looking for something that sets your home apart and replicates your tastes better than the status quo, flat-pack furniture you can check this out for inspiration!